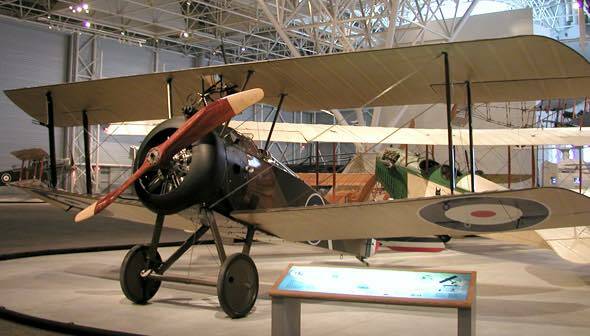 The Sopwith F.1 Camel was a single seater bi-plane fighter developed to replace the Sopwith Pup and the first flight took place on 22 December 1916. The 2F.1 (known as the Ships Camel) was a version produced for the Royal Naval Air Service (RNAS) with a more powerful rotary engine, modified armament and a fuselage that could be easily separated into two portions for shipboard use. The Camel also had a faster rate of climb and higher ceiling height then the previously operated Sopwith Pup. In mid-1917 Camels were supplied to the Royal Flying Corps and Royal Naval Air Service and were mainly used in the United Kingdom for home defence, on the Western Front and in Italy. The Camels used for home defence had the cockpit positioned further back and the guns placed on the upper wing. The name ‘Camel’ was derived from the hump-shaped cover over the machine guns. In order to combat German Zeppelins, 2F.1 Camels were flown from barges towed behind destroyers, from platforms erected on the gun turrets of larger ships as well as from early aircraft carriers. A 2F.1 also successfully flew after being detached from an airship; an experiment testing an airship’s ability to carry its own defensive aircraft. Ships Camels were operated from HMA Ships Australia, Melbourne and Sydney during 1918. Sydney first flew a Sopwith Pup from her recently installed rotating gun mount launching platform on 8 December 1917. 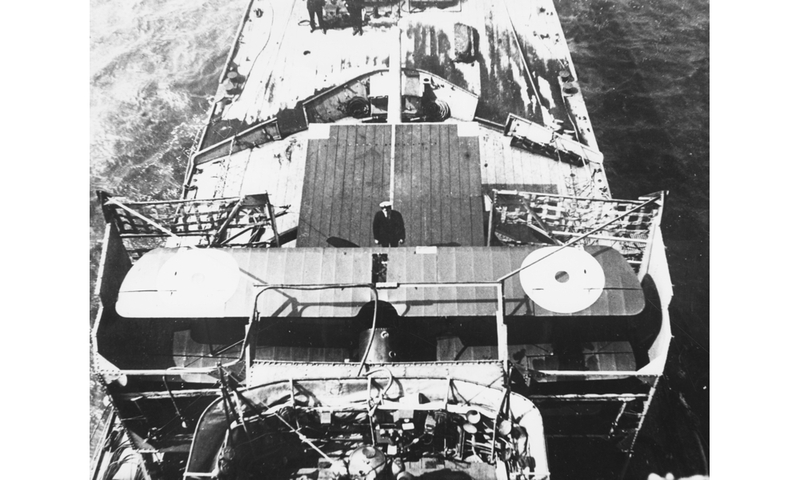 The cruiser was at sea steaming at 20 knots and with the platform facing right ahead to provide enough wind over the deck to enable the aircraft to be launched safely. A second flight on 17 December, with the launching platform trained 40 degrees to port, was also successful. Melbourne had her launching platform installed in March 1918. In May 1918 Melbourne and Sydney embarked a single Camel 2.F1 each which could be flown off from the wooden launching platform constructed over the forward six inch gun located in front of the bridge. A pilot and three RNAS maintenance personnel were embarked in each Australian cruiser. On 1 June 1918 both ships sailed as part of a force of 70 warships sent to sweep through the Heligoland Bight (Operation F3) in an attempt to draw German forces out to fight. Two German Hansa-Brandenburg W 19 twin - seat seaplane fighters attacked one of the escorting British destroyers and both Australian cruisers launched their aircraft in retaliation. Melbourne’s aircraft (piloted by Flight Lieutenant Lawrence Gibson) lost sight of the German seaplane in cloud and returned to ditch near the British destroyer HMS Osiris. While both pilot and aircraft were recovered the aircraft was badly damaged and written off. Sydney’s aircraft, piloted by Flight Lieutenant Albert Sharwood, had more luck and followed the German aircraft for over 60 miles and eventually opened fire. The German aircraft escaped in cloud, without damage, and Sharwood returned to the British ships and ditched his aircraft near the destroyer HMS Sharpshooter. He and his aircraft were recovered but again the Camel was later written off. While the results were inconclusive the action was the first use of ship launched aircraft against an enemy fixed wing aircraft (i.e. not a Zeppelin). The Australian cruisers continued to operate Ships Camels for the remainder of the war and they also has wireless fitted to assist with gunnery spotting during training exercises. The aircraft were put ashore in late 1918 following the Armistice. Left: A Sopwith Camel being launched from HMAS Sydney during 1918. Right: HMAS Sydney's 'Ships Camel' stored in its makeshift hangar over the forward six inch gun mount. A view of the 'Ships Camel' from the bridge of HMAS Sydney 1918.